Every kid in the world dreams of being a superhero—they know their superheroes, such as Batman, Superman, and Spider-Man, among others. They believe they have their own powers within them, but it’s very rare that the adults in the world would have their own fantasies too. But then again, there are adults that are just plain bored. 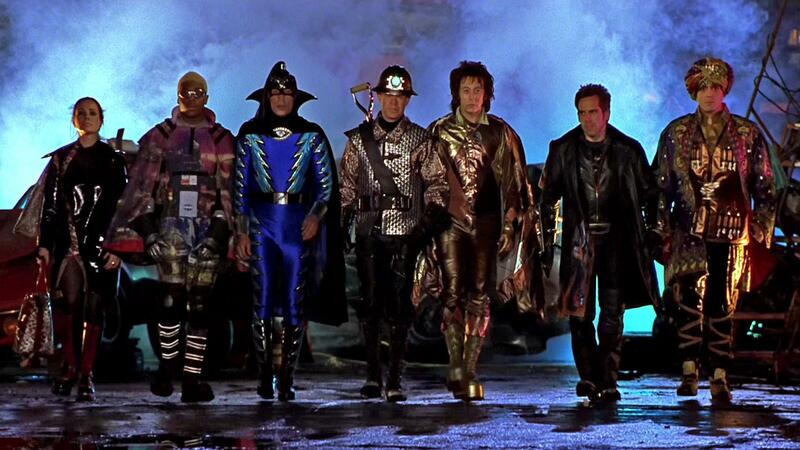 “Mystery Men” features a group of adults who band together to become the Mystery Men in their home Champion City, a metropolis nearly resembling Gotham City. They have no powers and neither does Captain Amazing, Champion City’s lone costumed vigilante. However, Captain Amazing has a ton of gadgets and swift energy, as does Batman in Gotham City. And he also has a fan base, which is where the Mystery Men come in. A trio of superhero wannabes—Furious (Ben Stiller) who gets his “powers” from extreme rage, Shoveler (William H. Macy) who is known as the “best shoveler in the world,” and Blue Raja (Hank Azaria) who hurls silverware (forks and spoons but never knives) with great strength—have a dream to become the backup crew for Captain Amazing (Greg Kinnear) some day. But it seems like they will have to be Amazing’s rescuers as Amazing is captured by his arch enemy from jail Casanova Frankenstein (Geoffrey Rush), a disco-loving villain who is released because Amazing thinks it’d make for great publicity—it’s refreshing to see that this superhero is not very smart. So it’s up to the second-rate superheroes to save Amazing. They recruit new members on their team—they get Invisible Boy (Kel Mitchell) who can only turn invisible when no one is watching, Spleen (Paul Reubens—yes, it’s Pee-Wee Herman) whose weapon is unbearable flatulence, Bowler (Janeane Garofolo) who hurls a fast-speed bowling ball with her deceased father’s skull inside it, and The Sphinx (Wes Studi) whose power is cliché-spewing dialogue. They band together, borrow some unique nonlethal weapons from a friend, plan to infiltrate Casanova Frankenstein’s disco lair and rescue Amazing (and soon, rescue their city from mass destruction). All of this is good fun and the actors look like they’re having a good time. Greg Kinnear hams it up as Captain Amazing (respectively), Ben Stiller in usual likable straight-man mode, William H. Macy and Janeane Garofolo have the film’s best lines, Geoffrey Rush is a hoot as the villain, and Hank Azaria, Kel Mitchell, Paul Reubens, Wes Studi are all fun company. And the best part—the actors portraying the Mystery Men portray their roles with straight faces. Also, there is humor for everyone. There are puns, sight gags, satirical dialogue about the superhero gimmicks, and juvenile humor. And there are some good memorable moments, such as the superhero interview, the first attempt to rescue Amazing, and the Invisible Boy’s “time to shine” (or in this case, time not to be seen). Some scenes are uneven, but as a whole, “Mystery Men” is a satisfying ride to take.